Those who know three-time Olympic speed-skater Brian Hansen have their own ways to describe the Glenview native. U.S. Speed Skating Long Track All-Round coach Tom Cushman’s praise for Hansen was almost endless, referencing Hansen’s attitude as a multi-year Olympian. “There’s no attitude, no arrogance,” Cushman said of Hansen’s personality. Olympic speed-skating teammate Mitch Whitmore, however, described Hansen as “wily,” especially when it comes to his hobbies. “He’s into a lot of crazy things, like surfing in lakes and Lake Michigan,” Whitmore said. 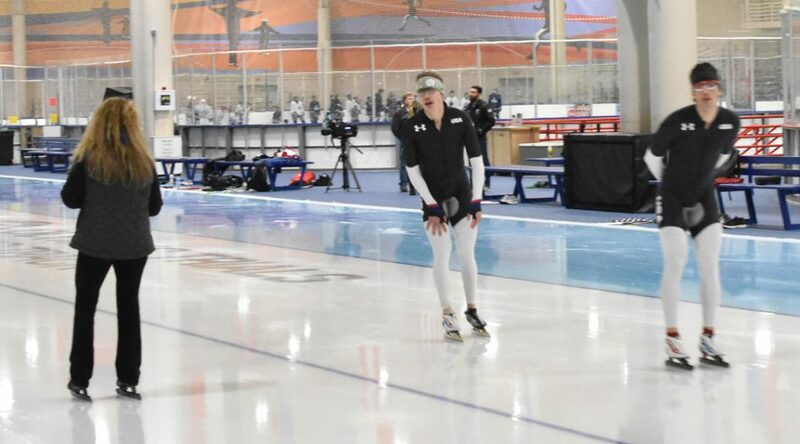 The 27-year-old Hansen displayed this hobby last February after the 2017 world speed skating championships in Korea. “It’s like 20 degrees outside and he just went surfing,” said Whitmore, who learned speed skating with Hansen at the Northbrook Speed Skating Club. While Whitmore’s “wily” description applies to Hansen’s hobbies, it also describes how Hansen found his way back into speed skating. He’s won a silver medal in the team pursuit event at Vancouver in 2010, and then did something speed skaters can almost never do: He took time off. Conditioning as a speed skater is a year-round affair. However, after the 2014 Winter Games, Hansen took two years off to finish his business degree from the University of Colorado-Boulder. “I had the opportunity to kind of do something else, so to speak, and just get a new perspective on speed skating and also get outside of the sport for a moment,” Hansen said. Taking time away from speed skating not only allowed Hansen to finish his schoolwork, but also to refocus on himself and his sport after he finished seventh in the 1,500-meter, seventh in the team pursuit and ninth in the 1,000-meter in Sochi. However, what Hansen did was more than just a simple break. During his two-year hiatus, Hansen forgot some key aspects of the sport. Some were as simple as what protein shake he would drink after a work out, while other parts were as important as how he would condition himself. Worst of all, forgetting how to condition meant Hansen was out of shape. To put Hansen’s two years in perspective, the longest break Whitmore ever took from skating was six weeks. Even then, Whitmore said he was able to feel his conditioning slip. To get back into skating shape, Hansen took up long-distance biking, a clever approach to conditioning, that almost matches his wily hobby of lake surfing. Cushman said the speed-skating team uses biking as a conditioning routine because of the specific focus it has on a skater’s lower body. 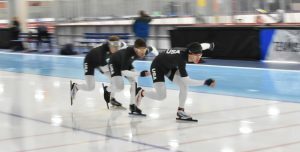 Hansen said he and his workout partners, fellow Team USA speed skater Jeffery Swider-Peltz and fellow 2018 Olympian Emery Lehman, would start from Milwaukee and bike to Chicago, Madison, Sheboygan and Devil’s Lake. Hansen was realistic about his training. Some distances, such as the 95-mile ride from Milwaukee to Chicago, would force Hansen and his group to stop and pick up where they left off. Cushman, who has been coaching the speed-skating team since June 2014, also said Hansen had to adjust how he biked due to a back injury he suffered when he returned to skating. Hansen would use adjusted handles and sit differently on his bike to aid his recovery, while conditioning his body to where it needed to be. Making training enjoyable took the place of the strict regimented routines that Hansen forgot when he took his sabbatical. While he did re-learn some of his lost specifics, Hansen admitted there are other aspects he simply forgot. Heading into the 2018 Winter Games, Hansen has qualified for the 1,500-meter race as well as the team-pursuit race. Racing with him in the team pursuit are Lehman and Joey Mantia. Lehman, who’s taken the spot vacated by five-time Olympian Shani Davis in the team pursuit and competing in his second Olympics, said Hansen’s experience helps him improve as a skater. Cushman said Hansen’s reputation among the skaters, in both talent and behavior, precedes him. Even with added motivation of trying to earn a second Olympic medal, Hansen isn’t expecting to end up on the podium in South Korea. Instead, Hansen will gauge his success on his individual performance. “On one hand, I don’t have the results that I did going into 2014, but I still have hopes that maybe I can get there,” Hansen said.